Short memories recently heralded the news of Durham, North Carolina’s population growth by attributing it to a revitalized downtown. But that doesn’t explain why Durham was the fastest growing city in the state over the decade of the 1990s, a decade before downtown’s reawakening. We forget that the Census of 2010 identified 178 million square miles in the U.S. where no one lives, meaning that around 47% of the America is unoccupied. Carolina Demography reminds us that a decade ago, 40% of the nation’s counties had lost population between 2000 and 2004 including 10 in North Carolina. But in the period between 2010 and 2014, 53% of the nation’s counties lost population including more than half of those in the South and half of the 100 counties in North Carolina, one of the nation’s fastest growing states. Some of this is due to out-migration and some because the remaining population is aging out. Rather than seeking to study and emulate places such as Durham as a “best practice, a few, very frustrated regressives in state legislatures here and across the country are pushing through repeated legislation to defile cities. But this relatively small group of regressives isn’t the reason this ongoing defilement of places is taking place in states such as North Carolina. The enablers are those peers who are merely disengaged, roughly half, according to studies. Just putting in time, these enablers fail to study or even read legislation trading the input of constituents for that of special interests paying for access or hoping for reciprocity. An eventual sea-change when it inevitably comes will be when voters begin to hold accountable this latter group. People often wonder if cities and towns really matter to people, in part, because it seems so many are in such a hurry to destroy what makes them distinct and marketable. But surveys which I repeated in a former life after seeing confidential results of polling by news outlets show that individual cities not only matter but so do the neighborhoods and streets where dwellers live. Since the 1950s, when broadcast licenses were issued for television, those meant to serve Raleigh, Durham, Chapel Hill and more than 20 surrounding counties, used their airwaves instead to try and erase the identities of individual communities. The reason, of course, was that they could charge more to advertisers if they could hoodwink them into believing consumers would commute long distances to buy something readily available closer by. Repeatedly, however, opinion polls showed that overwhelmingly, people preferred to characterize where they live by the name of a specific city, town or county. Next in characterization came specific neighborhoods and streets and a very distant fourth came the notion of region so desperately pushed by broadcasters. Rather than castrating cities and towns or trying to stamp out their identities, or pit rural and urban areas against one another, we should look at where the problems intersect. A good start might be to carefully read a Brookings Institution report released last summer entitled The Growth and Spread of Concentrated Poverty, 2000 to 2008-2012 when the number of people living in distressed neighborhoods grew by 5 million. Secondly is recommended a study of Complete Streets, particularly as they relate to economic development. Don’t get too literal as you read this. Strategically, it is relevant to rural areas as urban. 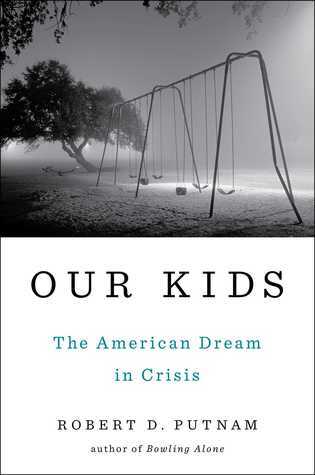 Tying these resources together, a reading is recommended of a new book entitled Our Kids: The American Dream in Crisis by renowned sociological researcher Dr. Robert Putnum who also wrote Bowling Alone and co-wrote American Grace. Putnam traces the roots of today’s inequality and lack of upward mobility through towns, neighborhoods, families, parenting, schooling and community and proposes remedies in each area. What he calls the centrifugal dispersion that altered cities and towns creating economic and class disparities, especially racial, probably also created a vacuum and related suction, as centrifugal forces do in a pump, that similarly also impacted rural areas. We need to work together not against one another to resolve both. It must begin, I believe, by electing truly engaged public officials at every level and in every district. I am referring to representatives who are willing to stand up against special interests and who hear the voices of all citizens equally, even if they are not raised equally.